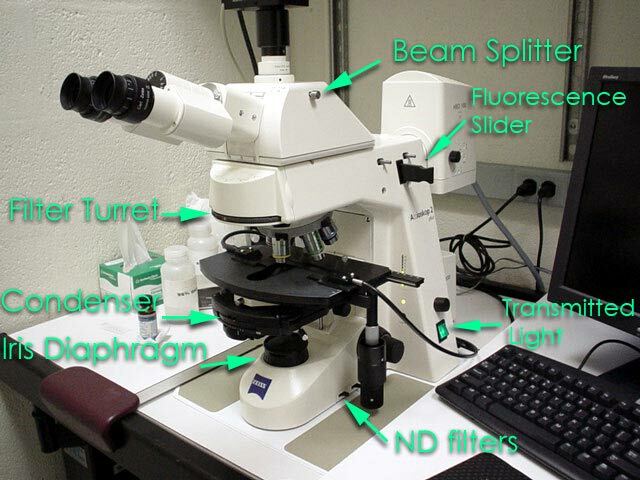 The AIF's "routine" light microscope. 2. 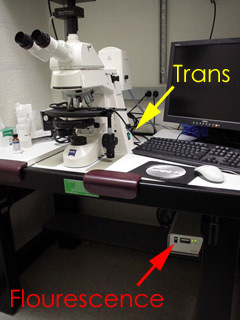 Turn on the Mercury Arc Lamp (under the microscope table). THIS MUST BE TURNED ON FIRST. 3. Turn on the transmitted light halogen lamp. 4. Turn on the computer. 5. Select the correct objective for your application. 1. 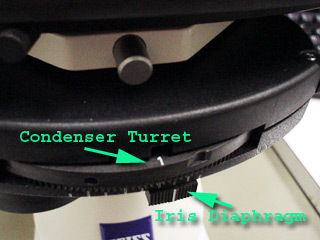 The fluorescence filter turret has several positions that may be used for different imaging applications. 3. Be sure not to close the Iris Diaphragm too much, it is a common mistake made by many people. 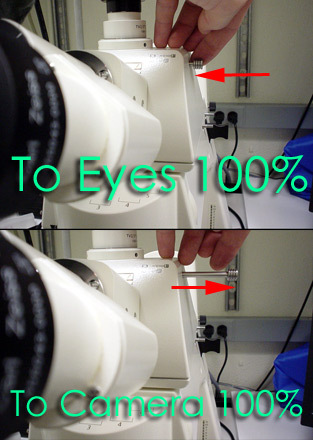 If the Iris is closed too much the resulting images will have greatly reduced resolution. Diffusion Filter -Should ALWAYS stay in the light path. 5. The transmitted light may be adjusted several ways. The 3200 K setting is bright and should be used to collect a color correct image. Simply, the sample isn't yellowed as it could be with a lower light setting. 1. 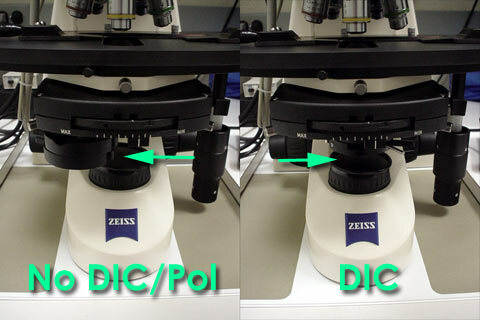 Place the slide on the stage and use oil if the objective is an oil immersion lens only! 2. The condenser lens must be in the light path when using objectives greater than 5x. 3. Focus on your sample. 4. 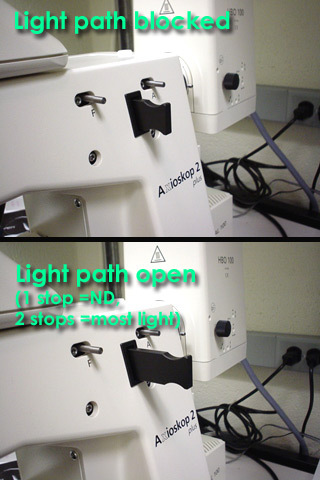 When the sample is in focus align the scope for Koehler illumination, the simple 4 step process described here. 5. You are now ready to image using the digital camera. 1. Log on to USER account. 2. Doubleclick the Axiovision software icon. 3. Click the workflow toolbar icon to display the following bar along the left side of the computer screen. 6. The camera preview mode has three settings: Slow, Medium and Fast. 7. The fast will allow a video-rate display with very low resolution, whereas the slow setting offers the best resolution (for focusing etc.) Though the slow setting seems to lag behind the actual movement it is suggested that you use it to do your image focusing with it. To change this mode use the pulldown list located near the video camera icon of the preview window. 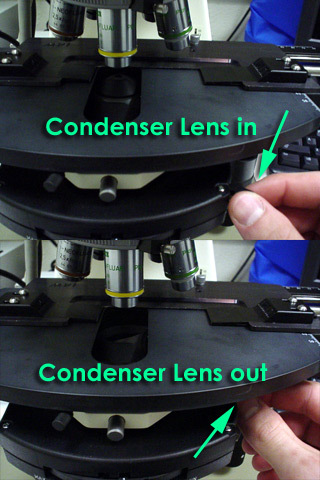 *On the bottom of the image window you must configure the objective magnification. It is extremely important to set this for the objective you are using if you plan on using the Zeiss Software to add a scalebar. 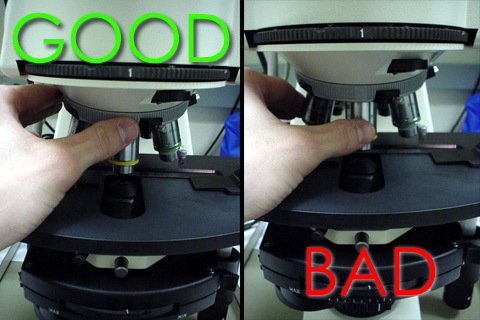 If you do not do this your scaling information will be wrong and we'll have no way of determining the scale factor later. 8. Click the "Live" button to start the live preview. 10. Click the "Live Properties" button to display the image properties window. This window has multiple tabs for adjusting various settings: The first and second tabs, Display and Adjust are the most commonly used. The display tab should show a straight black line above the RGB histograms, if it is curved it will affect the image display. To set the line properly just click the "Linear" button. 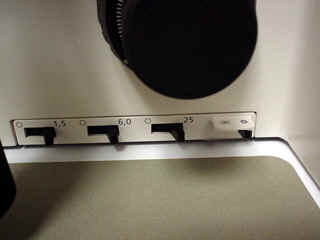 The Adjust window is used for setting exposure times and white balance. 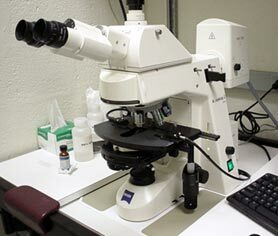 After focusing on the sample it is a good idea to set the exposure time. Click the "Measure" button to do this. To set the white balance, click "Interactive" and then use the eyedropper tool to select a white region on the image. If no white area is present move the field, select the white area and return to your sample. 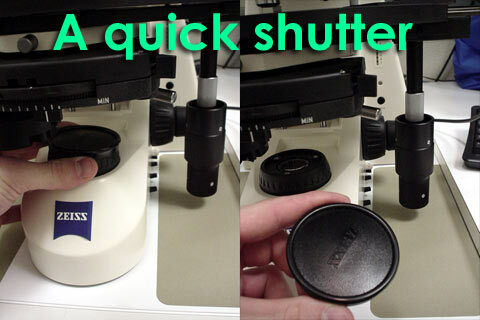 Once the exposure time and white balance have been set you only need to focus the specimen and then click the "Snap" button on the left panel. We suggest that you immediately save the image to your user folder which is located within the C:\user-files\ folder. Scales may be applied to the image immediately. Note that these will be "burned" into .tif files and cannot be removed. The files saved as .tif or .zvi will contain the scaling information which was configured above. The pixel dimensions are also posted on the AIF website. 2. Log off of computer. 4. Turn off camera (switch). 1. Select the correct filter from the turret. Dustin Grzesik 7-14-2005 optimized for IE Any dead links or other comments? Please contact the webmaster.